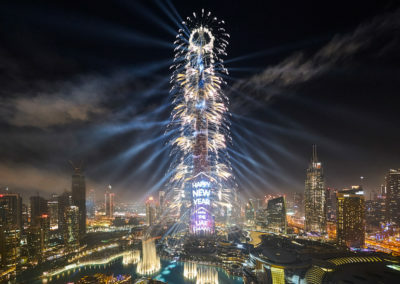 On behalf of the Meydan Group LLC and the leading agency Balich Worldwide Shows respectively, the creative specialists AO Creative were also charged with responsibility this year for the implementation of the show concept in the area of lighting and laser design under the direction of the celebrated lighting designer Jerry P. Appelt. 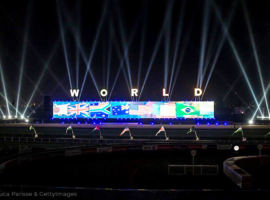 It has been the privilege of AO Lighting to supply special lighting equipment for the opening and closing ceremonies of the world‘s richest horse race. Providing the transmission between the creative ideas and their technical implementation, AO Creative drew up the technical shop order, specified the devices and decided upon positions and structures, as well as handling the programming of the show and live operation of the equipment. 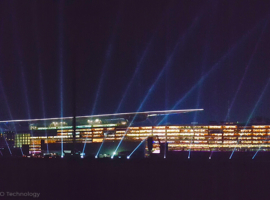 For six years in succession, AO Lighting has contributed in a variety of ways to the illumination of the prestigious Meydan Racecourse. 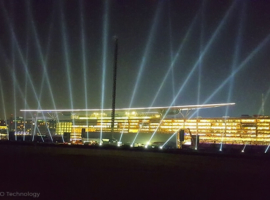 For the opening & closing ceremony of the 21st Dubai World Cup Night at the Meydan racecourse A&O Technology delivered a huge quantity of FALCON floodlights. The 2015/16 racing season was finalized with a big multimedia show. The Dubai World Cup in Meydan is one of the largest social and sporting events in the United Arab Emirates. 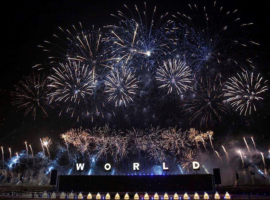 After a spectacular multimedia show at last year’s anniversary event, the Dubai World Cup once again took centre stage this year. Known for its unusual light shows, the FALCON range of powerful searchlights was repeatedly used to set bright accents. On behalf of eclipse Staging Services LLC, the technical crew of A&O Technology positioned a multitude of FALCON spotlights at four different locations. 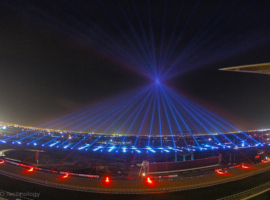 FALCON BEAM 2 and FALCON BEAM 7,000W searchlights were distributed behind the LED screens, in front of the VIP area at the racecourse and on the roof of the Meydan building complex. 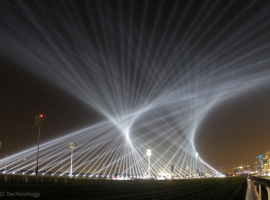 In addition, four FALCON BEAM 7,000W were used as follow spots for the artistic acts. Lighting designer Robert Jones (MIS) was responsible for the lighting design. 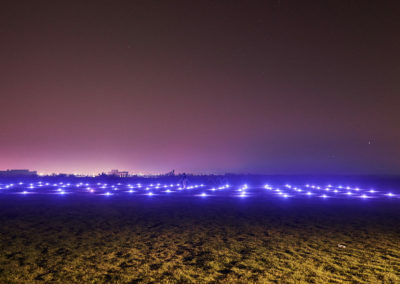 With the Xenon Searchlights he created a moving and colourful fan choreography for the opening and closing ceremony. At the concluding live concert of Janet Jackson, as part of her Unbreakable World Tour, the beams in white were used as static fanlights to stage the entire location. The FALCONs were able to show a lot of their repertoire in the Dubai World Cup Night with the precise accentuation as follow spot over powerful colours up to highlights visible for miles – convincing and effective. His Highness Sheikh Hamdan bin Mohammed bin Rashid Al Maktoum, Crown Prince of Dubai, personally opened the 21st edition of the world’s highest endowed canter race. California Chrome under Victor Espinoza won the main race this year with a new Meydan track record (coach Art Sherman, owner: Steven Coburn, USA). To mark its 20th edition, the Dubai World Cup like to present a spectacular multimedia show at Meydan Racecourse in Dubai. AO Creative and a lavish array of FALCONs contributed impressive light images. 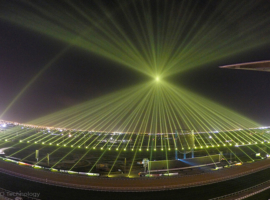 The end of the racing season at Meydan Racecourse was marked by a spectacular jubilee light show in two acts. 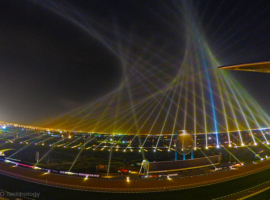 Over 160 searchlights and seemingly organic tornado sculptures forming a canopy of light above the world’s biggest racecourse created the framework for the closing ceremony. 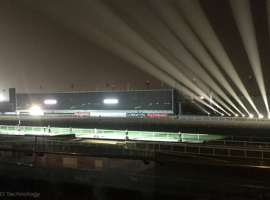 Never before had so many searchlights been deployed at the Dubai World Cup. For the design, programming and control of the lighting equipment for the Meydan Closing Ceremony, the general contractor, Fireworks by Grucci, under the direction of Phil Grucci (Executive Producer and General Creative Director) relied on the experience and expertise of AO Lighting’s creative department. 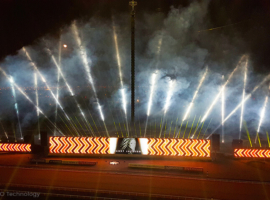 Under the creative direction of lighting designer Jerry P. Appelt, AO Creative stationed over 100 FALCON searchlights around the racecourse. 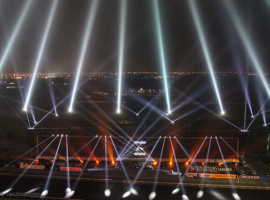 In addition to those it supplied for the Closing Ceremony, AO Lighting was commissioned by Eclipse Staging Services to provide just under 60 further FALCON searchlights for Meydan Racecourse. For the video show at the start of the Closing Ceremony, lighting designer Robert Jones arranged the FALCONs around the LED screen. Interacting with the video show, the searchlights provided brilliant accents. 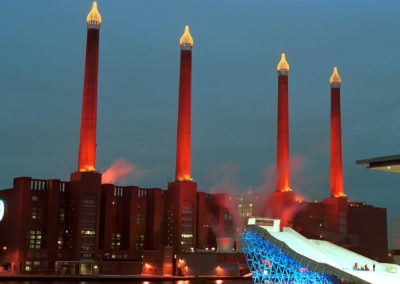 AO Creative realized a spectacular multimedia light show for the jubilee festivities. 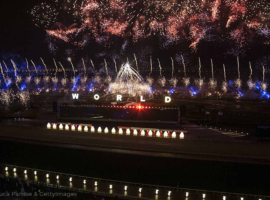 The musical light and fireworks spectacular broke the existing world record for the world’s largest pyrotechnic image. 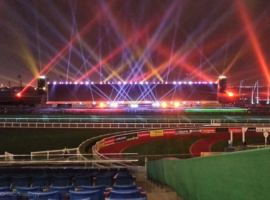 April 2014, Dubai/UAE – For the final event of the 2013/14 Dubai Racing Club season, A&O Technology Middle East supplied FALCON® Xenon searchlights to illuminate the location. The highlight was a live concert by superstar Jennifer Lopez. From 28 March to 1 April 2014, Meydan racetrack in Dubai provided the setting for the 19th Dubai World Cup. The final event of the season offers what is considered to be the world’s richest equestrian prize. 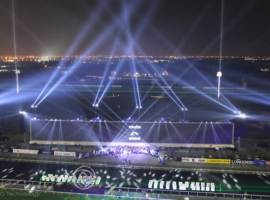 The exclusive concert was marked by a dazzling light show that lit up the entire Meydan racecourse. To support the show interludes as well as the entire choreography, A&O Technology installed FALCON® BEAM colour 7,000W searchlights that created a giant backdrop on the track behind the stage. 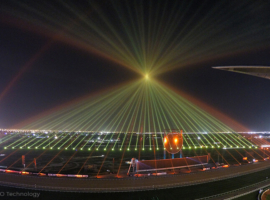 From this vantage point, the searchlights were able to crown the entire racecourse with a magnificent dome of light.